Thank you so much for this post! As a lover of the “forgotten” things of WW2. be they men, ships, planes, armies, or theatres of war, I developed an interest in the lesser known sides of WW2. (The Aleutian Islands theatre is one of my favourite topics, that and Dieppe.) 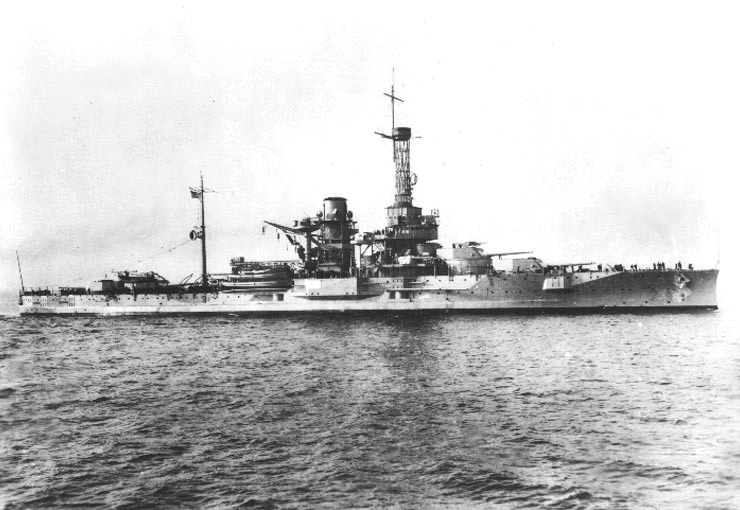 I have always been frustrated by people glibly naming the battleships lost at Pearl, and always excluding USS Utah. Yes, she had been converted to a gunnery training ship, and yes, she carried the ignominious title of AG, as opposed to the proud BB (battleship) title. But she was born a battleship, and she still bore her battleship name when she was lost. Her frequent exclusion is even more galling when you realise that one of the MOH handed out for bravery at Pearl went to Peter Tomich (as you cover above), an immigrant who gave his life to save his fellow engineering crew. 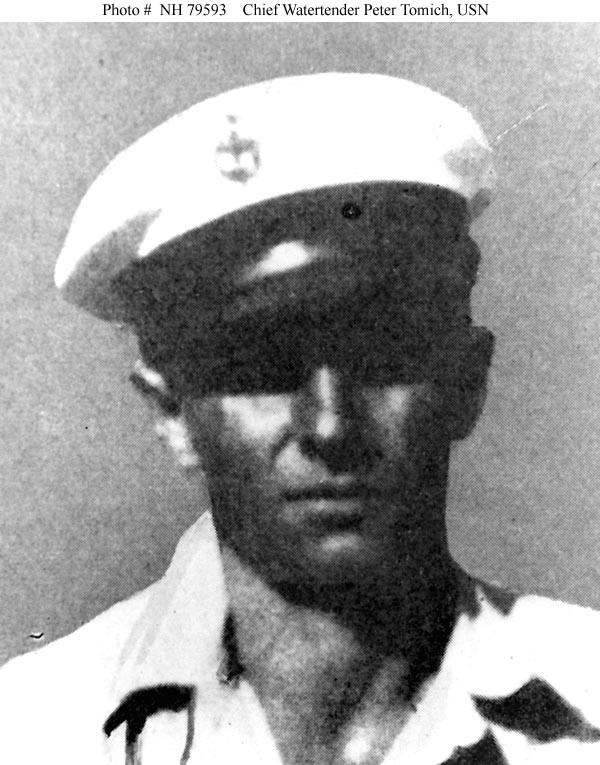 (For more info on the MOH winners, check out http://genealogytrails.com/ww2/PearlHarborMedalofHonor-pg01.html ). I hope there are some special ceremonies for the 70th anniversary next year – coverage was rather sparse today. As the old saying goes, “Those who forget their history are doomed to repeat it”. Thank you, Padre, for remembering an event so easily overlooked in today’s story-of-the-hour news coverage. Mr. Erickson sent me here to read this one … wow … the power of the lesser-known stories. I simply never knew. Since we are remembering the 72nd anniversary of the attack on Pearl Harbor this week here is an older post about some of the lesser known ships that were attacked on the far side of Ford Island during the attack. 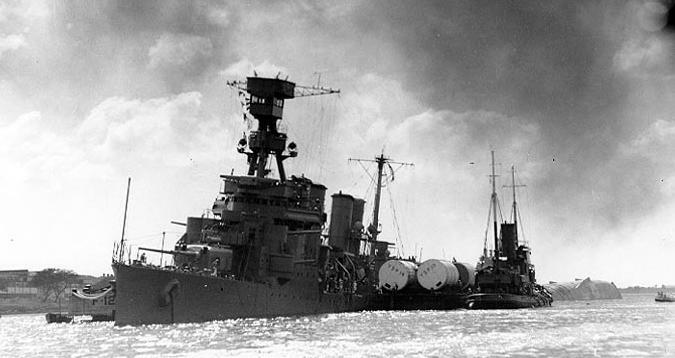 They were not the Battleships, they were a former Battleship converted to a gunnery training ship and target ship, a tender and an a pair of obsolete Light Cruisers. However, they too like their ore famous sisters on Battleship Row endured the assault of the Japanese First Air Fleet on that Sunday that will live in infamy. My first entry to Pearl Harbor,was Feb. 1960. I visited Ford island when we left some of our Landing Craft there in 1963,while we went out to be used as lab rats in SHAD experiments. 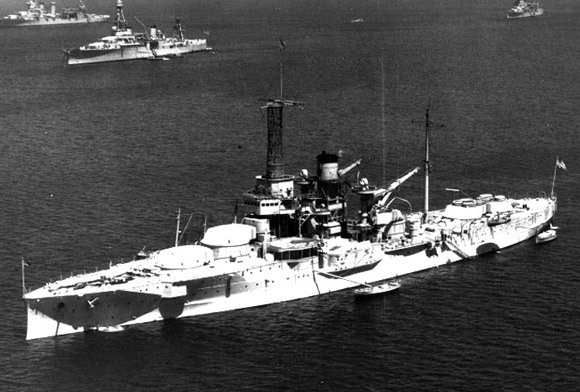 I was very upset that the USS Utah was so ignored. Those men died just as horrible a death as the men on the Arizona. I’m glad to see they now get a little recognition. I realize this is an old, 3 1/2 year old, post, but I felt the need to tell you that it is one of the VERY few places to find info on the Tangier. Thank you. Also a bit late, but little known fact is that the remains of the baby daughter of one of the crew remains interned in the hull. The father was intending to spread the baby’s ashes at sea but never got the chance. 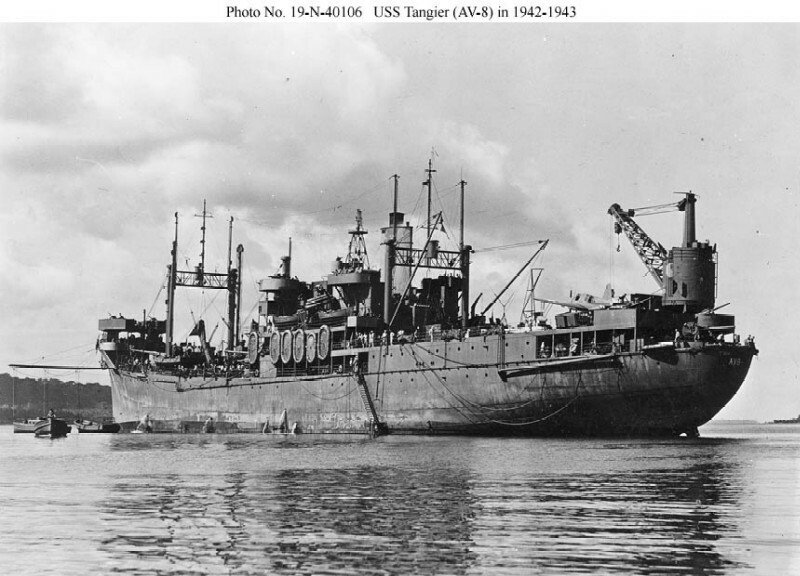 My Father was a photographer on board the USS Tangier on Dec 7 1941 And witnessed this terrible event. I do not know to this day if any of the film or still pictures were taken by him. Could someone help me? You might want to contact the Naval Historical center or the Pearl Harbor museum to see if they have anything that your father might have taken in an official capacity from Tangier. It would be interesting to see if they have anything on hand. Best of luck to you. 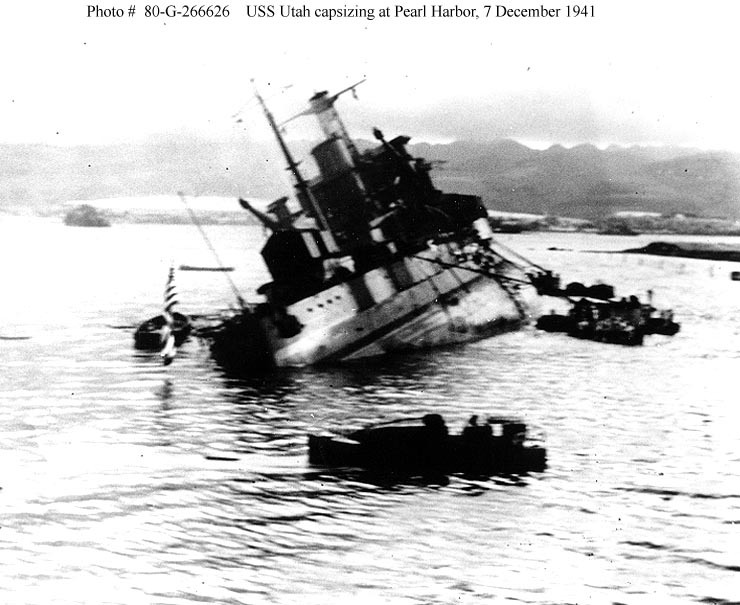 Since Tangier was moored astern of Utah there is a very strong possibility that he took the iconic photo of Utah rolling over. I just visited the USS Utah and it’s incredible sad that it is being forgotten. There needs to be a bus that can take people from the USS Arizona to the USS Utah. I am going to write the governor. These men have sacrificed their lives and should not be forgotten. Thank you for your article. I haven’t been to the Utah since 1978, her case is sad, so forlorn and forgotten. Thanks for your post and I hope you can get some results. It was rather eerie to see no one at the Utah memorial after being packed in at the Arizona. It really does need to be better publicized, and accomodations made so the public can access it. 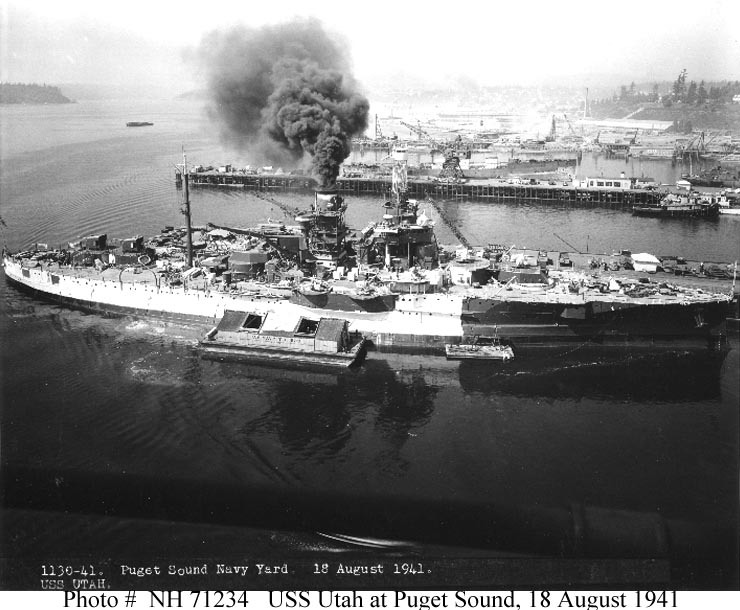 An important point is that the Utah’s sacrifice may well have affected the long term outcome, as if the attacking pilots had ignored her as per their orders, they would not have “wasted” torpedoes on that side of the island, and done more damage to the active duty ships on and near Battleship Row. It is October 17, 2016. I am a 98 year old ex radioman aboard the USS Detroit at Pearl Harbor on Dec 7, 1941. Still Kicking! Sir, thank you for your service and keep kicking! Blessings always! God Bless you Sir! 5th Daughter of your ship mate HT Craig V. Gates!! Frank did you know my grandfather he was also a radio man on the Detroit during the attack, last name Whitlock .. I hope you are still kicking, sir. If you get this, could you let me know if you remember my grandfather, Einar Juel, who was 51 at the time of Pearl Harbor and on the USS Detroit then and throughout the war. All blessings. My Dad was on the USS Detroit that December day too; his name was Charles J Rollins of Everett MA. Padresteve~~I had the privilege to visit the Utah in 1990. At that time, you could not get onto Ford Island without a Military ID card. I had one , so my wife & I could drive over the bridge. It was odd that when I inquired at the ‘gate’ to cross over the bridge, as to the location of the Utah,the young female Army guard knew nothing about the location of the site. Here’s a link to the Infant that’s still on the wreck. Thanks for taking the time to shed some light on a forgotten piece of history. don’t know if anyone has pointed this out, but one obvious reason few “tourists” visit the utah memorial is that a military id is required to get there. lived in Pearl 1955-59 as a child, Only memorial for the Arizona was a pipe sticking up with a brass plaque. Utah had nothing. 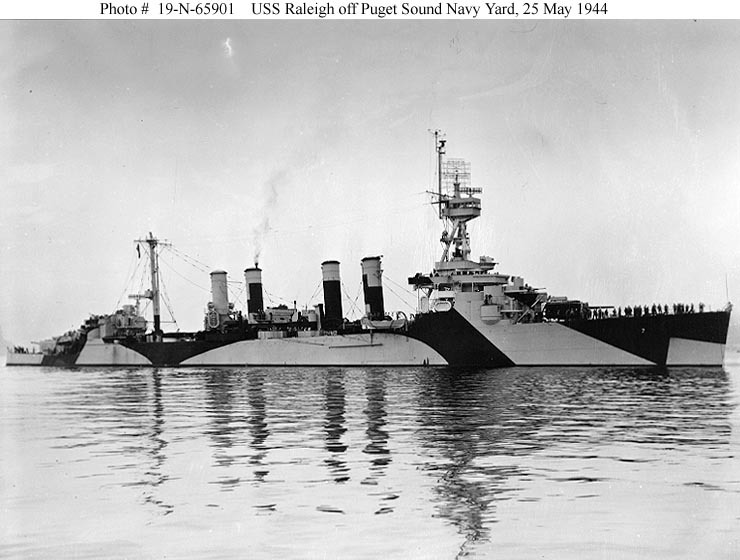 My dad was on the USS wright another seaplane tender that came into harbor early morning on the 8th. That day he went with a rescue crew to the Utah said they saved a few. He was the ships diver. Last time I saw the Utah was 1958 and it was still intact. I passed the wreck while on a sailboat. i was 12 years old in 1973 and living at Fort Shafter on Oahu. 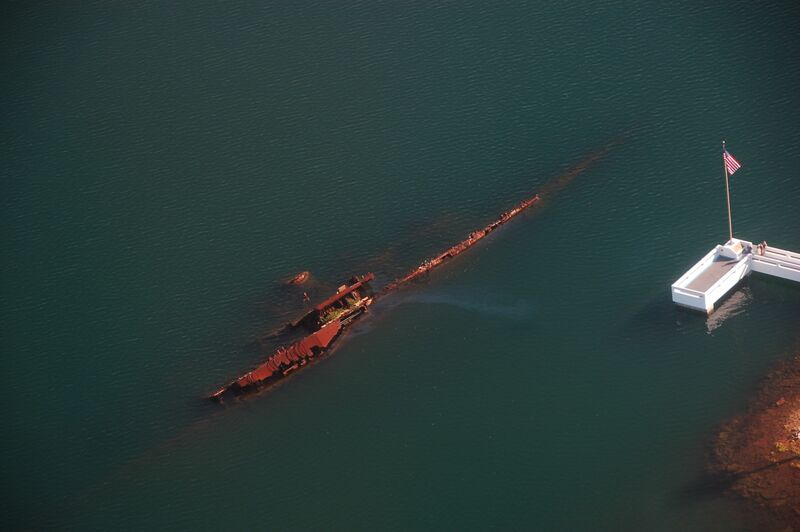 there was a lot more of the wreck back then and if I can locate the pictures we took i will post them. Today, December 6, 2017 I visited the USS Utah for the interment of two of the sailors who were on Her the next day in 1941. The two individuals were LCD Clark Simmons (USN Ret) and PO1 Harry Halstadt, The old ship is still there on the bottom on the west side of Ford Island and Mother Nature is eating away at Her. It was a very moving ceremony and my wife and I were honored to have attend. We live on Oahu so I’ll get a few pictures and post them.